There are two types of SCUBA diver on this planet – those that have experienced a panic type scenario whilst participating in their sport, and those that have not YET. So what is panic? Well, quite simply, according to the dictionary definition, it is “a sudden and overwhelming fear that can occur with or without cause and produce often hysterical or irrational behaviour in an individual”. Such irrational behaviour can often be fatal underwater. Panic is, in effect, an extreme form of anxiety which is a normal human response to what may be perceived to be a threatening or difficult situation. This human “anxiety response” can often help us to avoid dangerous situations. Anxiety, at least in its mildest form, can help heighten our awareness and, in some cases, make us safer, more conservative and better divers. In more extreme cases, however, anxiety may lead to panic which is an extreme flight reaction to a situation. This flight reaction is why panic is so clearly very dangerous for divers. 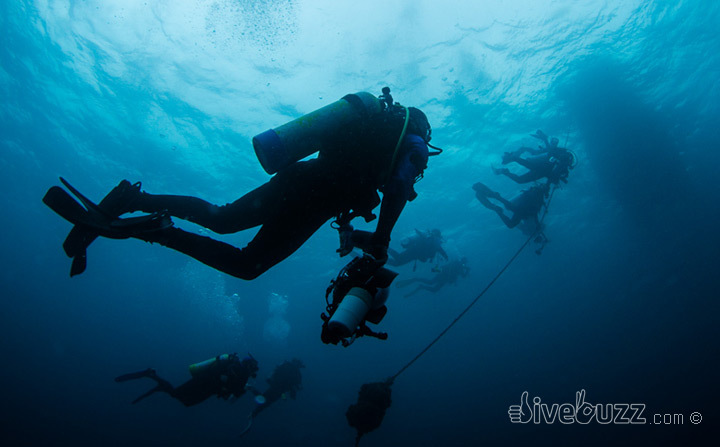 In inexperienced divers, there can be a very fine line between a relaxed diver and a panicked diver. That small difference can be as little as a tablespoon of saltwater. For instance, leaking masks are often a pre-cursor to invoking panic an inexperienced diver. What I am interested in here, though, is panic in the experienced diver. As I said at the onset, there are two types of diver, and for those experienced divers out there who have never panicked, it is only a matter of time… I believe that every diver has a personal threshold. Clearly, the more hours that you spend in the water, the more comfortable you will be with it. Similarly, training and keeping your dive skills fresh by practice are important in knowing how best to respond to scenarios. However, whilst training and experience can, I believe, raise an individuals threshold to panic, it cannot remove that threshold all together. The phrase “practice makes perfect” clearly may not be strictly correct when it comes to diving and avoiding panic. Perhaps, practice makes better would be more appropriate? Whilst I have never experienced a full-on panic scenario, there have been occasions where, as an experienced diver, I have experienced symptoms of heightened anxiety whilst diving that could have lead to a panic situation. On these occasions, it has always been in bracingly cold water, bad visibility and often rough seas, strong currents and unfamiliar dive sites. Perhaps a case of task loading? Yes, as an experienced diver, I can cope with rough seas, yes I can cope with bad visibility and cold water, yes I am comfortable diving in unfamiliar locations. But add them all together and perhaps I am starting to reach my personal threshold? On these few occasions, where I have experienced being close to my threshold, my experience ensured that I recognised the symptoms. Shortness of breath caused by hyperventilation and an anxiety induced feeling of sickness. I stopped, had a word with myself, gathered my thoughts, took some long slow breaths and calmed myself down. All was ok. I continued, and after the surprising situation, felt relaxed and ‘normal’ again. There is often a lot of ego involved in more experienced divers and I think that this can often be their downfall. It is ok to call a dive. No-one is going to think any the less of you if you do. In fact, they will respect you for making the call. So, if you are not feeling your best, are sea sick, cold, feel anxious on descent or for any other reason, don’t be scared to abort. There will always be another day. There will always be another dive. I believe it is also true that, often, more experienced divers may become more complacent. They have seen everything before and feel almost invincible, and as a result, they get sloppy. They often fail to conduct proper pre-dive checks, may rarely or never practice emergency skills, may not service or properly maintain their equipment. In isolation, this may not be an issue. I know one dive professional whose BCD inflator hose was faulty. Rather than get it fixed, he dived without his low pressure hose being connected to his BCD. He was perfectly capable of doing this as an experienced diver. However, this turned into a long term habit. Literally years went by with him diving with his hose disconnected. In this instance, nothing has happened YET. What I am saying, however, is that his complacency with his gear may sooner or later be his downfall. A strong down current, full exertion as a result leading to failure to be able to successfully inflate his BCD, task loading, panic, irrational behaviour and so on. I sincerely hope that this never happens …but it could.